A classic outdoors brand needed a jolt of energy to their retail business. Our strategy was to grow the hobbies (hunting and fishing) that support its business. Being an outdoorsman was the original "extreme sport," so we dared people to get out in the wild and provided the tools and guidance to do so responsibly. I shadowed a lifetime hunter for a number of very cold mornings. I never shot the gun, but came to understand why this hobby "gets in your blood." We went to a "Skinnin' Shack" party to interview hunters and made an interview montage video to brief the creative team. "I have to go with my dad and his buddies because none of my friends hunt." Retail sales are down because hunting and fishing, the store’s bread and butter, are stagnant hobbies (zero growth in a decade). The average outdoorsman is getting older and newcomers to the hobby are few and far between. "Somebody has to show you the ropes, but once you get comfortable, you're hooked for life"
Category: You can’t just decide to start hunting or fishing tomorrow. You need permits and a place to go but, most importantly, you need the right knowledge and skills. If you didn’t grow up in a family of outdoorsmen, it’s really difficult to start. Core Consumer: For seasoned outdoorsmen, the appeal of these hobbies is an excuse to be out in nature. 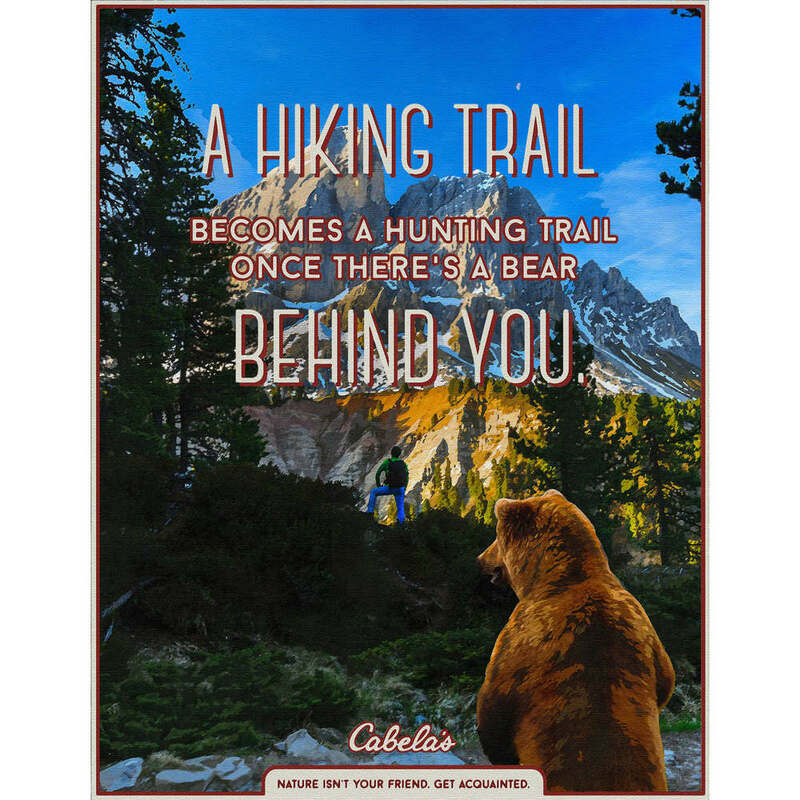 They emphatically don’t “hike,” but they do walk long distances in the wild to get to their secret spot. These outdoorsmen felt a strong responsibility to share their knowledge and most had taught someone else how to hunt or fish. Usually in the same breath, they reminded us that, out there, it can be life and death. New Target: The “Country Curious,” those who appreciate the outdoors and have been intrigued by hunting/fishing, but don’t have a "way in." This is the young guy with a camo hat who has never held a gun or the woman who grew up hiking, but just retired and always wondered what it was like to wrestle with a trout. We needed an aggressive campaign to push them off the fence into the wild. We didn't want dabblers. We wanted lifelong fanatics who understand that nature is definitely beautiful, but definitely dangerous. 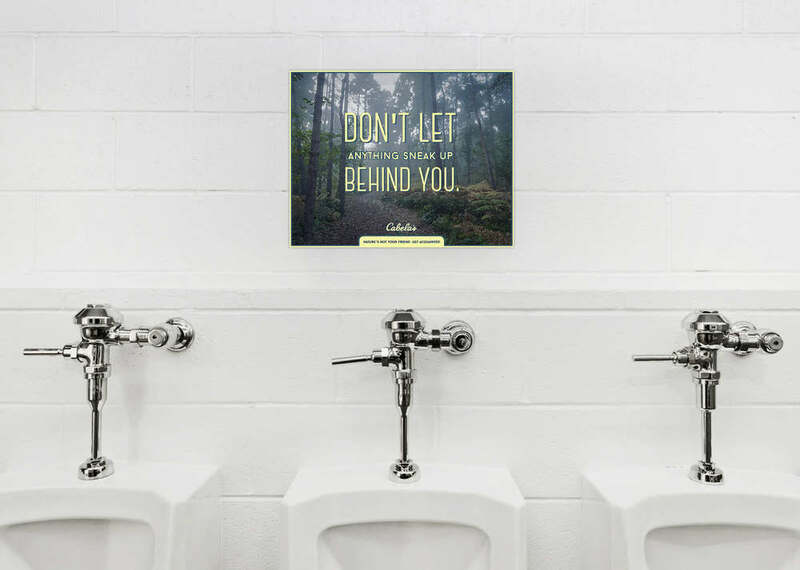 We created aggressive messaging, products, and experiences to generate interest in the outdoors and backed up the dare with resources and training, so that you aren't wandering out into the woods unprepared. The most recognizable interaction with Cabela’s for non-outdoorsmen is the popular arcade game Cabela’s Big Buck Hunter (It’s the one with the blaze orange shotgun in dive bars). 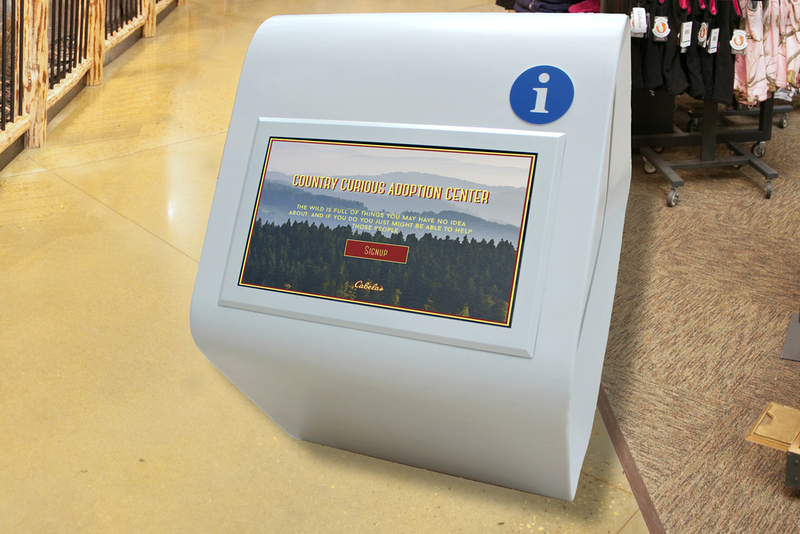 We created a more welcoming version called Cabela’s Small Snack Hunter. A vending machine where you select your snack choice by shooting it. The Gutter is a new product that demonstrates the appropriate depth required to field dress common animals. The Country Curious are eager to learn about these hobbies and seasoned outdoorsmen passionately want to share their knowledge. We created the Adoption Center to bridge this gap. The adoption center offers seasoned outdoorsmen discounts and free gear to encourage their participation. Cabela's already offers some educational components, so this program would provide a way to test those skills in the wild. It would center around a 10 step rank system that would encourage participation with incentives, but also bragging rights.